You don’t need to perform a search for a safe, trained caregiver. A reputable home care agency not only checks references and performs in-depth background and driving record checks, but it also handles the task of finding the perfect caregiver match for each individual, taking into account personality, hobbies and common interests, as well as schedule requirements and geographical locality. Agency caregivers are thoroughly trained, experienced, and monitored. An in-home care agency normally provides continuous caregiver training as well as initial orientation. Ongoing oversight also helps ensure that any necessary changes or assistance can be recognized and resolved. Tax obligations are the responsibility of the agency – not you. If someone decides to hire a home caregiver through a registry or private hire (such as through answering a “help wanted” ad), the client is accountable for all of the caregiver’s required taxes—this information is often not revealed. On the other hand, because all caregivers from a professional home care agency in Santa Rosa, CA are employees of that agency, all payroll taxes, workers’ compensation, liability insurance, and more are covered by the agency. Caregiver sickness and vacation time off are covered. It’s certain that at some point each and every one of us, including caregivers, will become sick or need time off for a vacation or to deal with other personal needs. An agency provides a back-up caregiver whenever a senior’s primary caregiver is ill or on vacation. In addition, an agency handles all employee discipline, to address and correct problems such as showing up late to work. Leave the supervision to the agency. A home care agency supervises all caregivers by a qualified individual. With an independently hired caregiver or one from a registry, there is no care supervision, opening up a client to the prospect of financial, emotional or physical abuse. We’re aware that, even when selecting highly qualified home care in Santa Rosa, CA, your family has many choices from which to choose. 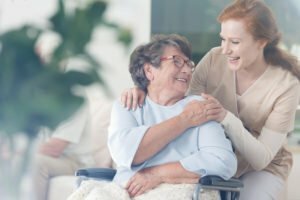 At Hired Hands Homecare, we believe our Santa Rosa senior care services are the best available, because of the high quality of our management team, the training we provide our caregivers, and our devoted caregivers themselves. We would love to talk with you to answer any questions you may have about the high quality senior living Santa Rosa CA families trust, to provide you with some resources particular to your loved one’s needs, or to arrange for a free in-home meeting. Call us any time at (866) 940-4343 or contact us online.